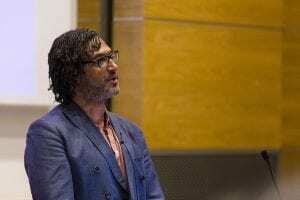 Historian, broadcaster and film-maker David Olusoga was invited to deliver the 2018 edition of the annual Cities Imaginaries lecture at UCL Urban Laboratory on 22 May. In some ways, the lecture was a return to UCL for the Civilisations host, who collaborated extensively with academics in UCL History researching the legacies of British slave‑ownership, as part of a documentary series broadcast on the BBC in 2015. At the UCL Urban Laboratory, Olusoga offered a thought-provoking historical journey through periods of housing crisis in the UK – contending that the problem is hard-wired into our cities. He questioned whether today’s levels of housing inequality and poverty may even eclipse that seen in the past.